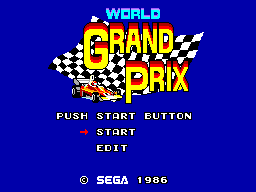 World Grand Prix can trace its origins back to a game called "GP World" that appeared on the Master System's technical forebear, the Sega SG-1000 - a console we sadly never saw in Europe. Essentially, this is a beefier version of that game that takes advantage of the Master System's increased power. The box art for the western release is an oddity. It is part of the notorious clip-art batch that came before Sega switched to proper box art akin to pretty much all other consoles available at that time. 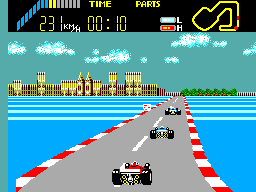 In this instance there is a chequered flag where some of the black squares appear to have been blown off by the speed at which your car has passed the finish line. I get the idea but I prefer the Japanese box art which has a beautifully painted F-1 car. While certainly inspired by the look of Formula 1 racing, this isn't a simulator. 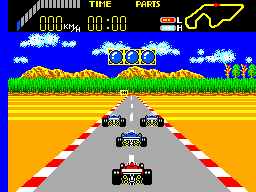 This game is often likened to Namco and Atari's "Pole Position" series and while not without merit, they actually take slightly different approaches to gameplay. Like a plethora of racing games at the time, the clock is your biggest opponent rather than other drivers but instead of just completing a race under a set time such as in "Hang On", here you have a number of target times to determine your place on the finish line. You must place 6th or upwards to progress and the higher you place the more points you get. These points are then converted into money you can spend on improving your car. There are 12 tracks spread out across the world for you to compete on. As you'd expect, you aren't alone in this high octane world and there are other drivers trying to slow you down. You have to manoeuvre your car between theirs to get that quickest time but if you collide with another car or an obstacle off the track then KABLOOEY. Your car explodes like it is filled with napalm. A rather unique feature that "GP World" included and is retained here is the track editor which allows you to design your own tracks to race on. While limited, it does give this otherwise generic racer something to stand out in the crowd. The graphics are typical of very early Master System titles. The colours are all rather bright and as I have said in other reviews, would not look out of place on Season 1 of "The Simpsons". The cars aren't particularly detailed but they do the job well enough which is what can also be said for the background which works to give you a sense of racing in different countries around the globe. The crash explosion is pretty spectacular however. It's not special to look at but not overly bad either. There are a few pleasant little jingles and some basic sound effects for the explosions and sliding around corners but this isn't pushing the Master System sound chip. It has to be remembered however that this was a 1986 game and back then it was still common to have games with little or even no sound at all so it probably wasn't given a high priority. Adequate. Again they do the job and its nothing too complex. Button 1 and 2 are the brake and throttle. The D-pad changes gear and steers. This should all be familiar to "Hang On" fans. The car responds well enough although you do get a feeling of how wide it is compared to the road which makes passing other cars tricky at times. You have two gears - Low and High - which you select by pushing up or down on the D-pad. The lower gear is needed for starting the race or slowing the car down. Like "Hang On", the nostalgia factor is going to have a big impact on the score here. For those who had it back in the day then they are probably more likely to pick it up again as it remains quite playable. For those who are trying it for the first time now then the generic feel of it will probably discourage repeat plays. I'm being a coward here and scoring it right down the middle. In terms of the racing genre on the Master System, this for me sits nicely in between "Hang On" and Out Run". Not a bad game at all but it is hardly memorable either. The track editor has a certain novelty to it but it won't hold your attention for long. There are plenty of copies out there and it is one of the cheaper titles to get. I'm sure you can find space for it on your shelf.